3 questions to Mathieu Doussoux, Sales Engineer, Engineering and New projects BU. 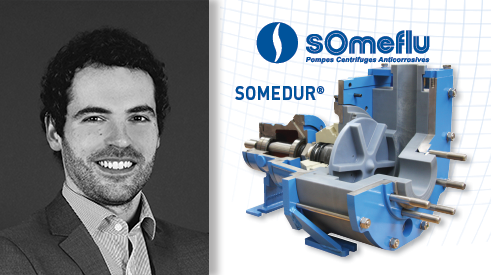 SOMEDUR® is the perfect combination of your plastics expertise and your experience as a pump manufacturer… Could you tell us about the characteristics of this product? SOMEDUR®, a Someflu registered trademark, comes from a UHMW PE resin base that may be similar to that of our competitors as it comes from the same resin producer but its specificity comes from the use of a special additive (our trade secret) which gives it its distinctive colouring (blue-grey) but also, and especially, better abrasion resistance. Currently it is one of the best existing materials in this field. This formulation also made it possible to widen the temperature resistance gradient beyond that of the market’s UHMW PE 1000 or 6000, and we provide solutions for temperature levels of 95 or even 100°C. In the field, how does this technology best meets the constraints of the most difficult applications, and why? We mainly use this technology in our VORTEX and SLURRY pumps because they are specially designed for corrosive and charged applications such as mining and phosphate fertilizer industries. The advantages of SOMEDUR® plastic on this type of pumps are many: a reduced TCO (Total Cost of Ownership), an extended MTBF (mean time between failures), that can be up to twice or three times that of other materials. In fact, our equipment is more reliable on installations transporting abrasive fluids. Production down-time for maintenance is reduced, and the needs in spare part supplies are lower… The combination of all these elements explain the attractiveness of SOMEDUR® for our clients, and we are very proud of this. So Someflu is the only industrial pump manufacturer to be able to offer SOMEDUR® pump components? Yes. We are currently the only ones that can provide such pumps using SOMEDUR®. The most complex parts of this equipment are processed by our Aplast BU which, thanks to its specialisation and experience, makes it possible for us to meet quality, size and geometry requirements that very few businesses in the world are able to produce. A real measure of our know-how, for example, is our work on 500 mm diameter impellers that are 250 mm thick, without any cracks, bubbles or settling (moulding defects) issues.